You can fill a bowl with warm water and a drop or two of dishwashing liquid and turn on the mixer for 15 seconds to loosen food. 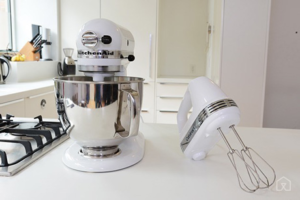 But the safest way to clean the mixers is to disassemble and hand wash non-electrical components in hot soapy water or place them–as recommended by the manufacturer–in the dishwasher. Finally, unplug the appliance and wipe down the outside with a cloth dipped in warm soapy water. Rinse with a cloth dipped in plain water and dry with a soft cloth. Grab that soft toothbrush to get between any buttons or crevices that need special attention. One particular place to check for accumulated debris is the motor ventilation slots. They need to be clear to prevent overheating.